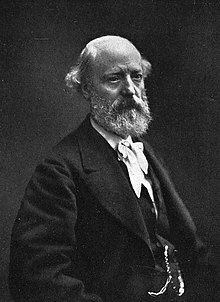 Eugène Emmanuel Viollet-le-Duc (French: [øʒɛn vjɔlɛlədyk]; 27 January 1814 – 17 September 1879) was a French architect and author who restored many prominent medieval landmarks in France, including those which had been damaged or abandoned during the French Revolution. His major restoration projects included Notre-Dame Cathedral, the Basilica of Saint Denis, Mont Saint-Michel, Sainte-Chapelle, and the medieval walls of the city of Carcassonne. His later writings on the relationship between form and function in architecture had a notable influence on a new generation of architects, including Antoni Gaudí, Victor Horta, and Louis Sullivan. In 1844, with the backing of Mérimée, Viollet-le-Duc, just thirty years old, and Lassus, then thirty-seven, won a competition for the restoration of Notre-Dame Cathedral. Their project involved primarily the facade, where many of the statues over the portals had been beheaded or smashed during the Revolution. They proposed two major changes to the interior: rebuilding two of the bays to their original medieval height of four stories, and removing the marble neoclassical structures and decoration which had been added to the choir during the reign of Louis XIV. Mérimée warned them to be careful: "In such a project, one cannot act with too much prudence or discretion...A restoration may be more disastrous for a monument than the ravages of centuries." 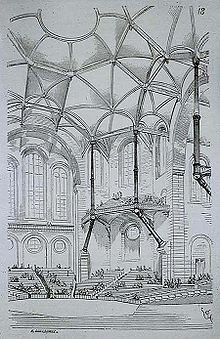 The Commission on Historical Monuments approved most of Viollet-le-Duc's plans, but rejected his proposal to remove the choir built under Louis XIV. Viollet-le-Duc himself turned down a proposal to add two new spires atop the towers, arguing that such a monument "would be remarkable but would not be Notre-Dame de Paris". Instead, he proposed to rebuild the original medieval spire and bell tower over the transept, which had been removed in 1786 because it was unstable in the wind. The bells in the two towers had been taken out in 1791 and melted down to make cannons. Viollet-le-Duc had new bells cast for the north tower and a new structure built inside to support them. Viollet-le-Duc and Lassus also rebuilt the sacristy, on the south side of the church, which had been built in 1756, but had been burned by rioters during the July Revolution of 1830. The new spire was completed, taller and more strongly built to withstand the weather; it was decorated with statues of the apostles, and the face of Saint Thomas bore a noticeable resemblance to Viollet-le-Duc. The spire fell on 15 April 2019, as a result of the Notre-Dame de Paris fire. In 1863, Viollet-le-Duc was named a professor at the École des Beaux-Arts, the school where he had refused to become a student, and the fortress of neoclassical Beaux-Arts architecture. This launched him on a new academic career as an architectural theorist, where he would have as much influence as he did as an architect of restorations. There was much resistance from the traditional faculty, but he attracted two hundred students to his course, who applauded his lecture at the end. He had already published the first volumes of his first major work, A Reasoned Dictionary of French Architecture. This series eventually included ten volumes, published between 1854 and 1868. But while he had many supporters, the faculty and many of the students were strongly against him. His critics complained that, aside from having little formal architectural training himself, he had only built a handful of new buildings. He tired of the confrontations and resigned on 16 May 1863, and continued his writing and teaching outside the Beaux-Arts.